Human nature is one of the most diverse things we see on planet earth. Sadly, not all of human nature is benign, good, warm, welcoming. One of the negatives we exhibit is called cheating. Be it at school, on our partner, at work, it’s an undesirable trait. But in motorsport? Yes, it happens. All too often. And it happens worldwide. It happens in rallying. It happens in Formula 1. It happens in IndyCar. It happened here in Australia. America’s NASCAR was full of innovative people. At one time they had specified a maximum size for the fuel tank. A “clever” interpretation of the rules has Smokey Yunick fit a fuel hose that was eleven feet long and two inches thick. As a result, his car’s overall fuel capacity was increased. Ynick also sidestepped the rules by having an oversized tank fitted but with an inflated basketball inside. This allowed the tank to be filled to more than the regulated amount once the ball was deflated. Tim Flock decided on a different way to improve the fuel economy of his NASCAR. His steel roll cage wasn’t steel. It looked like steel, but close inspection had a wooden structure smartly painted to resemble steel. Australia’s royal motorsport name was involved in a somewhat cheeky cheat in 1981. Fabled F1 designer Gordon Murray built a car for the Brabham team that had adjustable ride height. When cars are scrutineered there’s a set ride height they have to adhere to. Murray built in a system that would lower the car under that ride height but would raise it back to the required amount when stopped. Murray’s sense of humour was brought into play by having a box with leads that would attach to the car, for no reason other than to visually distract onlookers, placed at random locations on the car when stopped. Another entry from NASCAR with Ken Schrader finding his tyre wear exceeding the ability of the car to deal with it. Although leading a race, the second place car was closing rapidly. A quick thinking Schrader discharged his fire suppressant system and the second car’s driver, thinking Schrader’s car engine was about to explode, backed off. The canny Schrader timed this well enough for his lead to get him over the line for a win, with his car in perfect working order. 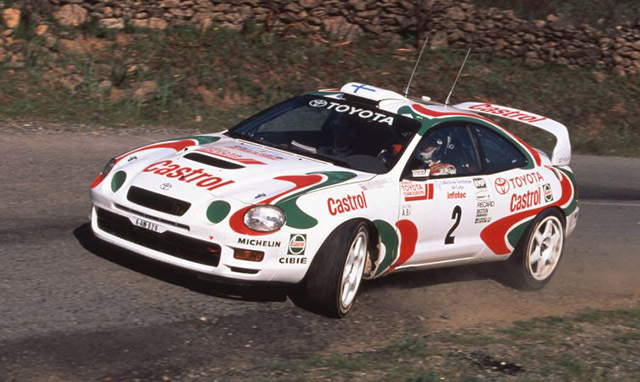 Japanese goliath Toyota dominated the world rally scene with its awesome and aggressive looking all wheel drive Celica. Complete with huge rear wing, quad headlight front, and legal turbocharger…wait, did I say legal turbocharger? 1995 and the car is dominating the rally world. The WRC had stated a maximum horsepower output of 300. Toyota had abided by the rules that stated a restrictor plate must be fitted inside the turbo. What they also interpreted was that the regulations said nothing about the restrictor plate having to stay in one spot. Some brilliant engineering had the plate being moved by springs that allowed extra power to be generated, with an estimated fifty extra horsepower. The design of the turbo was such that a thorough pull-down of it was required to see the plate and even then this appeared almost as it should be. Australia’s great race, the Bathurst 1000, closes out this quick look at motorsport cheating. The 1987 race was won by the stove hot Ford Sierras. Factory supported they were quick, at times almost undriveable according to Rare Spares ambassador John Bowe, but a little bit of physics came in to play for the win. Larger tyres cover more distance for little extra effort and the first two cars, both from the same team, were found to have enlarged wheel arches at the front, allowing a bigger rolling diameter tyre. Subsequent investigation and appeals against the team had them disqualified, handing the win to the third placed team. That team was from HDT and the car was driven by David Parsons, Peter McLeod, and one Peter James Brock. The win, under less than ideal circumstances, gave the great PB his ninth and ultimately final ATCC win at The Mountain. Do you know any ingenious tales of people skirting the rules in motorsports? Head over to the Rare Spares Facebook page and let us know in the comments section below this article.